This AutoCAD 2005 training covers both 2D Basics and 2D Advance topics for AutoCad 2005 and 2005 LT. No separate training for 2005 LT is required. 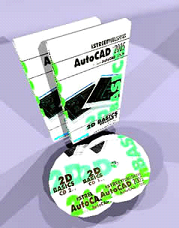 AutoCAD 2005 Training for 2D Basics and Advance thoroughly examines drawing, editing, viewing and plotting in AutoCAD. You will find all of the essential material necessary to create 2D drawings in this concise and thorough presentation of AutoCAD 2005 drawing basics. This series concludes with tutorials on drawing a floor plan, a steel part, and how to plot them.